Fluid conveyance company The Rare Group has been awarded a contract to supply the first of two phases of a new slurry pipeline at a copper mining company operating in Zambia. 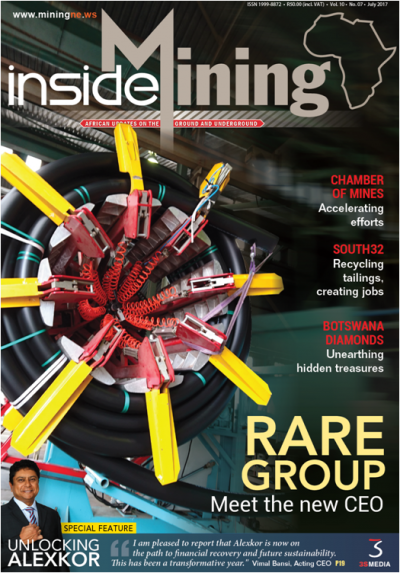 Rare will supply and install 3 175m of 610 mm Nominal Bore (NB) steel pipe lined with a high-density polyethylene (HDPE) lining at the Konkola Copper Mines’ Muntimpa tailings storage facility near Chingola. The HDPE pipes used for the project are manufactured at the Rare Plastics factory in Meyerton near Johannesburg and the steel pipes are sourced from Barnes in Wadeville, Johannesburg. The project was awarded in August this year and work commenced in October. The supply, installation and commissioning of the pipeline should be completed by February 2015. The project is executed by Rare employees from South Africa as well as local Zambians employed by Rare Zambia. The contract to install the second phase of the pipeline will be awarded next year. The pipeline is an expansion of existing infrastructure to allow the mine to handle larger volumes of slurry. It will also be used as a back-up system for possible pump failures, says Rare Group pipeline services manager Carl von Graszouw. This project comprises the supply and installation of the 610 NB steel pipeline, lined with Rare’s 624 mm HDPE SDR 17 plastic liners, as well as the supply of 108 flanges. It also includes civil engineering work, bush clearing as well as commissioning. This is a high profile project which plays a major role in the continued operation of the mine. When phase two of the project is completed in 2015, it will be the last phase of three slurry pipelines measuring a total of 25 km and operating at 20 bar pressure that would have been installed by Rare for Konkola Copper Mines in Chingola.